The late Thoroughbred, Secret Compass (R), fractured a leg on the home turn in the Breeders' Cup Juvenile Fillies Race at Santa Anita racecourse, and euthanized. WHAT has been emphasized repeatedly is the notion that conditioning prior to skeletal maturity in the young racehorse is vital to the development of soundness and strength. No question about it. However as has also been identified there is the fundamental requirement for an appropriate training and racing regimen that precludes unnecessary and debilitating trauma. In the current Thoroughbred racing prototype, particularly so in North America, the goal is to take advantage of every possible opportunity whether that be through the exploitation of young horses, the use of pain-numbing medications that continue to allow the injured horse to race and of course the incessant inbreeding and over-breeding in pursuit of the next sensation on the track. It is not surprising then that racing interests insist that rigorous training and racing of young horses is actually of benefit to their immature musculoskeletal systems. Time and again this excuse is given to justify their standpoint on 2-year old Thoroughbreds. But of course, this is to their own advantage seeing as time is money in the lexis of the racing world. And sure enough the racing industry has addressed this issue with their own statistical analysis to evidence the advantages conveyed to these horses. As always then the question arises as to whether these statistics and the analysis of the data are without compromise. Much of the time these studies are flawed in some way, whether through omission of data or simply inexact conclusions. Several studies have focused on the long-term soundness of Thoroughbreds that were worked as 2-year olds to determine whether these horses are in fact predisposed to higher incidents of injury and/or prematurely shortened racing careers. Information from an article entitled “The Wait for Age Riddle” authored by Renee Geelen lends some interesting insight as to the veracity of training and racing 2-year olds to enhance and strengthen their musculoskeletal structures compared to those horses who are not raced until after the age of two. Selected data from this analysis is shown in the following charts and tables. The charts in Figures 4 and 5 suggest that horses who have the most number of starts at the age of two tend to have longer racing careers than those who have fewer starts which supports the hypothesis that higher levels of training and racing contribute to more robust skeletal structures. In other words the higher the number of starts a horse makes at age 2 the longer their career spans and the higher the number of overall starts the horses makes over the length of their career. 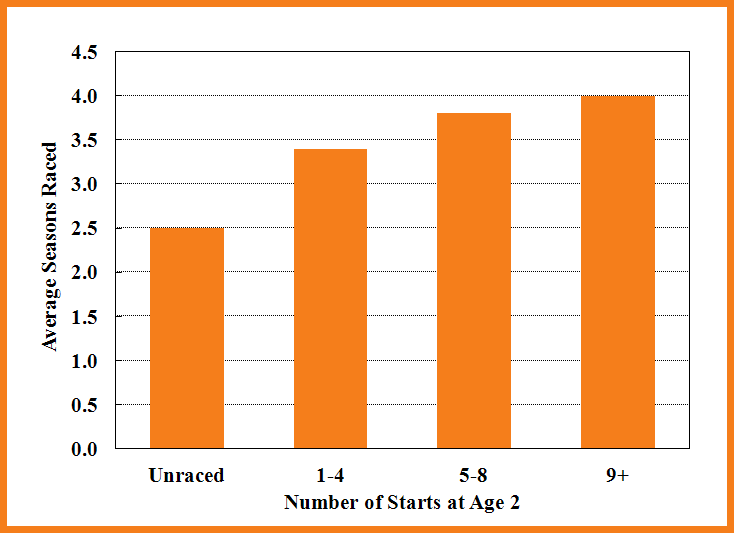 However, as shown in Figure 6, on closer inspection it is clear that the greater majority of the horses (~ 90%) in the study had less than 4 starts at the age of 2 with the majority of these horses having been unraced at this age (56%); only 10% managed to compete in 5 or more races during their 2-year old career and a mere 1% raced more than 9 times. What then does this imply? In the article Geelen plainly identifies the intrinsic ability of any given horse as the determining factor of success on the racetrack. As in any other sport there is range of ability that sets some athletes apart from others. Therefore one would naturally expect lower performance horses to compete in fewer races. Is this the case for the seemingly longer careers observed for horses who were worked more rigorously as 2-year olds? Table 1 would certainly suggest so. Clearly 92% of those horses that did not place only raced for 1 (54.2%) or 2 (37.7%) seasons while 78% of stakes winners had 3 or more seasons of racing behind them [i.e. 3-5 seasons (65.2%) and 6+ seasons (13%)]. Otherwise stated, horses with the highest ability are apt to race for longer periods of time simply from a monetary perspective. Those who show less promise early in their careers are not as likely to continue racing for extended lengths of time simply for the reason that they are turning no profit. Moreover a look at the data for stakes-performers-only, taken from the same article, further corroborates this premise of ability over conditioning. As shown in Table 2 and Figures 7 and 8 the data collected in this study clearly infer that preparation of the young racehorse has little to do with career success, rather it seems, on the whole, it is more so related to a horse’s ability. As these figures explicitly demonstrate, early entrance to training as a 2-year old has no effect on either the average number of seasons raced or the average career starts of horses with given ability, as shown by stakes performances. No significant differences are observed for either of these statistics regardless of whether a horse was unraced at the age of 2 or whether a horse had raced in excess of 9 times as a 2-year old. What this decisively communicates is that the success of a racehorse, given the required and appropriate training regimen, is a function of the aptitude of the horse, not the age at which they first begin racing. In consequence of the “stakes-only” horses analysis, what the original study’s intentions were in proving out the potential benefits of early training and racing now become debatable. According to The Jockey Club’s Thoroughbred Safety Committee, a study on the racing of two-year-olds was initiated to refute the belief held by the “ill-informed” that racing horses at the age of two predisposes them to increased risk of injury, unsoundness and prematurely shortened racing careers. Upon inspection there is clearly a trend in the data that presumably supports the premise that horses who begin their racing careers at the age of two are more successful, have longer careers and are less prone to injury. As Figures 9 through 12 demonstrate, in each and every case, horses who raced as 2-year olds had seemingly longer careers and were more successful on the track. But is this a fair assessment? In reality what this data does not show, contrary to what the Jockey Club claims, is whether or not horses raced as two-year olds are less prone to injury; in the article this conclusion was arrived at by extrapolation, not factual data. How many 2-year olds sustained career or life-threatening injuries during training and/or racing and are therefore not included in the “head count”? Moreover, instead of comparing only the number of starts, exactly how long did these horses race? How many were retired to the breeding shed after racing as a three-year old? No doubt these horses account overwhelmingly for career earnings. Did some of the unlucky ones that didn’t race at two simply not make the grade or suffer career ending injuries only to be expediently loaded onto the meat-man’s truck for the arduous journey through the slaughter pipeline? Skewed distributions can lead to misleading statistics, since the skewed distribution can drive an average up or down. For example, the average income of a given population (e.g. group of horses) may be low, but a handful of people (e.g. talented horses) might have high earnings, which skew the average income of the population upward. Hence badly skewed data can lead to erroneous conclusions. More to the point, just as with the New Zealand study, is this apparent advantage truly a function of the benefits derived as a result of racing as a two-year old or is it conceivably due to ability or other factors not included in the data? In other words, are Thoroughbreds that start racing at the age of two simply better athletes? Categorically the ability factor is a key contributor to skepticism of the survey as was shown with the New Zealand study. Secondly, there is no question that in North America, purses are generally highest for two and three year old races. Together with the ability factor this would help explain the higher average lifetime earnings for horses that raced as two-year olds. Furthermore, stakes graded races (Grade I, II and III) for large purses, such as those leading up to and including the Triple Crown or the Breeders' Cup for example, use pre-defined selection processes and ranking hierarchies based on past performance of the horse. Each horse is assigned a point value based upon their best performance in the 24 months before and after the race, including performance in the renewal of the race under consideration. Obviously for 3-year old races, racing as a 2-year old will no doubt increase the odds of earning a berth as a contender particularly for those horses who demonstrate ability – a powerful incentive to start a horse as a 2-year old. Given that many Thoroughbreds do not race past the age of five due to injury or poor performance on the track while others are retired to the breeding shed at three is it any wonder why horses racing as two-year olds have higher career earnings? After all, an extra year of racing represents half of the horse’s career after the age of three and a third of their career by the end of their fourth year – a definitive advantage in terms of potential earnings. In any case, those that earn the honor of retiring to be bred at the age of 3 have, without doubt, turned vast amounts of profit for their owners compared to the average horse. Needless to say, the greater majority of these superstars raced as 2-year olds. Another piece of data that is missing from the survey is the actual number of horses in each of the categories and if those numbers changed over time; it is well known that large variations in sample sizes when comparing data can complicate interpretation (e.g. how big is the sample size compared to the population size?). 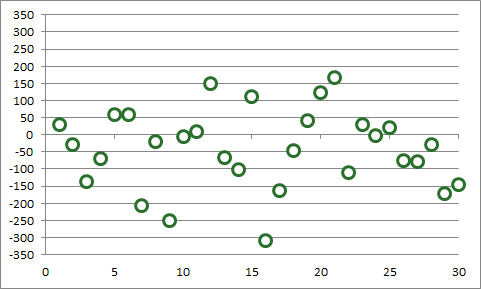 What was the relative proportion of horses that raced as two year olds in 1975 compared to those that did so in 2000. Anecdotal evidence suggests that two year old racing today is far more prevalent than it was 30 years ago. If this is the case does this lend credence to the idea that aptitude prevails over early entry to a racing career such that in 1975 for example, only the most precocious horses raced as a 2-year old based on their superior ability. Moreover, by and large, in North America’s current business enterprise of racing the majority of horses start their careers as two-year olds primarily by reason of return on investment. And so in today’s racing climate since most horses begin their career as two year olds could this information conceivably alter the outcome? Again, is ability the factor contributing to the results of the data analysis? In any case, none of these questions is addressed - conveniently, it seems. A number of facts that could potentially confound the data have been cleverly omitted. But then again, this is the only data available for public scrutiny so what else can be expected? Considering the nature of statistics and ease of data manipulation in combination with factors not included in this assessment is this data skewed? What it does not explain is the seemingly forthright survey evidence that cites the high incidence of breakdowns during the preparation of young horses for 2-year old races and the myriad issues that plague their immature musculoskeletal systems. Where is this information and how would this affect the results? Perhaps this opposing assessment of The Jockey Club data is too harsh? You be the judge.